I haven't been outside much, but the studio lights are burning day to night. Sewing is such a happy time for me. Almost ready for Quilt Market! inside :: still stitching, still sewing. My new fabric collection, Tilly, arrived! I'm sewing up a storm. It gets prettier every day! If you are going to Quilt Market, plan to stop at the Blend booth (#756-762). It's all going to be there in 12 days! inside :: knitting under blankets. outside :: summer stopped right there. 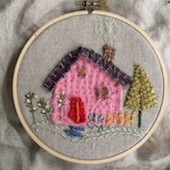 Stitching a bit while I'm home and waiting for my new Tilly cuts to arrive so I can start making for Quilt Market. It will be busy here in the studio soon! Have a lovely weekend - in or out! Honestly, I didn't know Vermont was that close to us. It's a mere three and a half hours away through the prettiest rural counties and towns on the back roads of New York. Years ago I met Meleen at Silver Bella and got to know her at other events too, Mary's workshops in Saint Louis and the ones I hosted here in New York. Such a lovely, generous and delightful friend! She always said that one day we would all get together for a girls' weekend at her cottage in Vermont. Our classic New England weekend of wonders included Kana, Suzanne, Danielle and Hope. All so, so much fun. A celebration of the end of the end of summer. And the beginning of real autumn. If you get the chance, visit southern Vermont. It's so incredibly beautiful and charming. Even better, discover it with an adventurous gang of sweet new friends. Thank you, thank you, dear Meleen!